Nationality: American. Born: Mysore, India, 27 January 1924; (often mistakenly called Sabu Dastagir) became American citizen, 1944. Family: Married 1) Bibi Ferreira, 1947 (divorced); 2) Marilyn Cooper, 1949; two children. Career: Elephant driver, discovered by director Robert Flaherty while working in the elephant stables of the Maharajah of Mysore, 1937, actor. Died: Chatsworth, California, 2 December 1963 of heart attack. "Story of Sabu: From Elephant Boy to Screen Star," in Senior Scholastic , 24 September 1938. Roberts, K., "Civilizing Sabu of India," in Photoplay , January 1939. Bacon, R. L., "Jungle-Book Boy," in St. Nicholas , March 1939. Obituary in Time , 13 December 1963. Obituary in Newsweek , 16 December 1963. Leibfred, P. "Sabu," in Films in Review (New York), no. 10, October 1989. In 1934 Frances Flaherty, wife of the noted documentarian and filmmaker Robert Flaherty, wrote from India to a friend about a film project called Elephant Boy. At the time they had not yet found an actor for the title role, but were interviewing possible candidates. "I watch them play around," she writes, "kicking a football, shouting and fighting like kids everywhere, and think of the strange stroke of fate that is hanging over one of them. There is one boy among them . . . different from the other sprightly little sprouts. He is rather pathetic, more reserved, an orphan. His mother's family came from Assam, where the people are part Mongolian. His name is Sabu." Selar Shaik Sabu's father had died in 1931; his mother died in 1924 soon after his birth. Sabu became a ward of the Maharajah of Mysore for whom his father had been a 4th generation mahout, or elephant driver. As was customary, the boy followed in his father's profession. His skill, combined with a natural intelligence and charm, gave him the edge over the other boys, and he spent the next year working for the Flahertys. The actual filming suffered extensive delays due to bad weather. Taken to Britain in 1937, along with is brother, Dastagir, (an error when they passed through British customs led to the widespread misapprehension that the actor's name was Sabu Dastagir) to help publicize the film, Sabu became an instant star. The film was loosely based on "Toomai of the Elephants," one of the tales in Rudyard Kipling's Jungle Books , and fed the popular British interest in the exotic details of life in its colonial empire. Based on the success of his first starring role, Sabu was next chosen to play one of the two protagonists in The Drum , a story of the friendship between an Indian prince and a British drummer boy, which was filmed in Wales. Sabu's first visit to the United States was a publicity tour for The Drum. He was to return for location shooting for his third, and best, film The Thief of Bagdhad , and eventually to take up American citizenship. The young actor's enthusiastic performance as Abu, the titular thief, shares equal credit for the phenomenal popularity of this film with the art direction of William Cameron Menzies, who had also worked on the original Douglas Fairbanks version in 1925. The Thief of Bagdhad also suffered extensive delays, mostly due to Britain's entry into World War II; this, combined with the need to do some location shooting in the Grand Canyon and the Painted Desert, is what caused the shift of filming to Hollywood. Living in Hollywood, Sabu was tempted to sign a multi-film contract with Universal Studios, which he did in 1942, the same year he finished his last film for Alexander Korda (who had produced his first three films), The Jungle Book . Based on four more stories from Kipling's work of the same name ("Mowgli's Brothers," "How Fear Came," "Tiger! Tiger!" and "The King's Ankus"), The Jungle Book features Sabu as Mowgli, a boy abandoned by his parents in the jungle and raised by a pack of wolves. The film very ably contrasts "the ways of man" with those Mowgli learned from his adoptive family, both by letting us listen in as he is educated by his human mother (Rosemary de Camp) after his return to human society, and through a voice-over narration by Joseph Calleia, which makes the participation of animals as characters possible. Although he could not have guessed it at the time, Sabu's signing of the contract with Universal marked the beginning of the downward spiral of his acting career. In the 1940s American audiences developed a fascination with "the exotic" similar to that of the British public which first caused Sabu's removal from his native state. Other personalities who briefly became stars in this period were Carmen Miranda, Turhan Bey, and Maria Montez. While they might appear as supporting actors in major Hollywood productions, they were more often seen in the B-movies which in many cases were only a few cuts above exploitation movies. Universal Studios was particularly adept at turning out this sort of film. In rapid order Universal placed Sabu in three films in which he received third billing, after Montez and Jon Hall— Arabian Nights, White Savage , and The Cobra Woman. The Indian actor began to take on his familiar role as the entertaining sidekick to the star (Jon Hall) in these movies, and the plots were mostly constructed from amusing nonsense which was partially covered up by the, then less common, use of Technicolor to accentuate the exotic nature of the settings. Sabu became an American citizen early in 1944 and immediately enlisted in the U. S. Army Air Force. He became a tail-gunner on B-29s in the Pacific theater, flew 42 combat missions, and earned a Distinguished Service Cross, the Air Medal, four battle stars and three clusters. After the war he returned to Universal to make Tangier with Maria Montez, and then returned to England where he was reunited with his Thief of Bagdhad director, Michael Powell, in a supporting role in Black Narcissus. After another British picture, End of the River , the actor returned to America for his last effort at Universal, The Man-Eater of Kumaon. 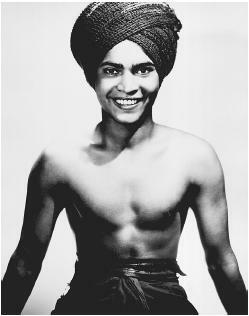 Moving over to Columbia, Sabu starred in Song of India , made personally notable for him by his meeting with Marilyn Cooper, who was to become his wife. Recognizing that his film career was fading, soon after his 1948 marriage the actor diversified into real estate and other ventures, a prescient move since the jungle and fantasy films in which he had made his name fell out of favor as the 1950s progressed. For the rest of his life, Sabu took whatever work came his way, including one Allied Artists film whose title contained his name, Sabu and the Magic Ring. During this period he acted in three European productions, and successfully sued to stop the distribution of Jungle Hell , in which footage of him from a never-released project was combined with a mishmash of other footage without his knowledge. On 2 December, 1963, Sabu suffered a fatal heart attack. He was just 39 years old. A great actor that should have been given an oscar, perfect effortless acting never coming out of charactor sad he died so young and nevergiven the chances he should of had. I will always remember him in "Sabu and The Magic Ring"! This was as I recall a wonderfully fantastic film and it will always be one of my favorites! I wish it were available for purchase!